The supreme Lord Srikrishna says to Arjuna further : O mighty armed Arjuna, I shall impart to you my supreme advice for your welfare, my friend. Nobody (neither the Gods nor the Demons) knows my origin. He who is not deluded among mortals, who knows me as birthless and as the supreme Lord of the world, is free from all sins. Intelligence, knowledge, freedom from doubt and delusion, forgiveness, truthfulness and other such qualities come from me alone. The seven sages and the four manus originated from me. One who knows my opulence and true power is united with me. Arjuna asks Lord Srikrishna thusL O Kesava (Lord Srikrishna) , I accept all that you have said. Please tell me more about your nature (your divine manifestation) and also let me konw how am I to meditate upon you? Lord Srikrishna explains thus: Listen to me as I will only explain to you some of my potency. I’m the self abiding in everyone’s heart. I’m the beginning, the middle and the end of all beings. 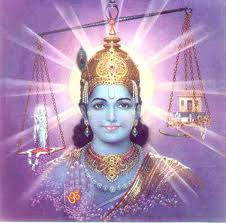 Of the Aditya’s I’m Vishnu; of Lights, the radiant Sun; of heavenly abodes, I’m the moon. Of the Vedas, I’m Sama Veda, of the God’s I’m Indra. Of the senses, I’m the mind, and of the living beings, I’m consciousness. Of the Rudra’s I’m Shankara, Of the Yaksha’s I’m Kubera; Of the Vasu’s, I’m Agni and of the mountains, I’m Meru. Of the priests, I’m Brihaspathi, Of the military commanders, I’m Skanda, Of the bodies of water, I’m the Ocean. Of the godly sears I’m Narada, of Gandharva’s I’m Chitrartha. OF weapons, I’m the Thunderbolt, Of mantra’s I’m Gayatri. Of the wise, I’m Vyasa; Of the poets, I’m Usana. Of the purifiers, I’m the Wind, Of warriors, I’m Rama, Of fish, I’m the shark, Of the rivers I’m the Ganges. I’m the letter ‘A’ and I’m death , the destroyer of all , I’m source of things yet to be, I’m fame, ,memory, speech etc. of women. Of secret things I’m silence, of the wise, I’m wisdom. There is nothing moving or unmoving that can exist without me. Know that whatever in existence is powerful, glorious and beautiful, emanate from me. But why do you want to know all this, when all you have to know is that a fraction of my power sustains this universe. That is the end of this chapter. Note that I have not included all manifestations. More in a week’s time.